Tribals in India constitute around eight per cent of the total population. Oraon is one of the tribal communities found in India, which mainly depends on agriculture for earning their living. They are also known as Kurukh tribes. These tribes are mainly found in the states of Jharkhand, Bihar, West Bengal and Orissa. In the ancient days, Oraons used to make their living by chopping timber and selling forest products. Majority of the population of Oraons can be found in Northeastern states engaged in the occupation of tea cultivation. Oraons are considered to have the second largest population of tribes in Bihar and Jharkhand. Efficient, particularly in tea garden works, Oraons are believed to have settled in the Chotanagpur Plateau centuries ago. Oraons speak Kurukh language related to Dravidian family. Majority of the Oraon tribes are Hindus and are religious minded people. They worship Gods and Goddesses but a great number of these tribes have adopted Christianity. In the ancient days, this community used to follow Sarna religion. Oraons are further divided into sub-castes like Kudas and Kisans, who follow Patrilineal family customs. 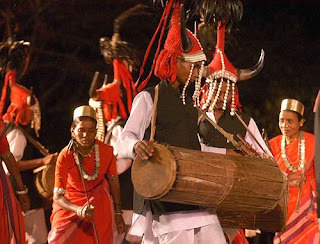 There are a total of 14 clans in Oraon tribal community like, Gari, Lakra, Kispotta, Runda, Tirky, Toppo, Linda, Ekka, Kuzur, Bek, Kerketta, Bandi, Minz and Khalkho. This tribal community in India is also known world wide as they still believe in following age old custom of human sacrifice. These sacrifices are carried out during the famous Sarhul festival celebrated before cultivation of crops, as a mark of respect to please the local deity. Festivals have been a part of life for tribals since ancient time. Sarhul and Karma are the two main important festivals of these tribals. They are also very fond of music and dance. Karma, Jadur, Dassai and Kagha Parva are their most favorite dances. Traditional instruments like Nagara, Kartal and Mandar are still used by these people. Its really one of the most informative blogs I have ever visited. After visiting the site now I got to know that there are so many tribes in India. i have correction regaring photo... i have never seen oraon dance like this...its a dance from moriya janjati (tribe) of baster dist.(CG). i know it because i m from oraon tribe. it would be appriciatable if you correct it..
i surely agree with stela and deepal about the photo,as i am an oraon too...and alot indulged in my own tribal dance, so that dance pic is not ours. And u have spelled 'KUJUR' wrongly as 'kuzur'. So please revise this page with necessary corrections. To whom it may refer. Today most of the Hindus and hindu political parties have the tendency to include Uraons to Hinduism. But Uraons are not Hindus and can not be Hindus.They are animists. They believe only only in One God. They do not worship Goddesses. They offer sacrifices to the spirits of their ancestore. Oroans are the Animists and the Hindus, so please write them Animist instead of Hindua. because, you yourself have mentioned Sarna. they dont belive in human sacrifice nor it is done. i totally agree with sunny. christian uraon dont practice human sacrifice nor our religion permits it.our people respect each individual whatever be their religion, they hold human values in great regard. I would like to add a suggestion that the tribes has their independent religion it is not associated with Hindusium.As Anthropolozist has define a tribe is a set of people following a definite set of tradition and culture , People shall not be misguided that the tribes in India are a part of Hindusium,each tribe in India follow their different culture and tradition.Some Indian Antropolozist has wrongly claimed that some tribe are a part of Hindusium,Yes it is true that now some tribes due to deculturisation has adopted other relegious tradition of Hindu's,Christanity,etc. The Information furnished and collection are appreciable.But there are some main collections are not true.The Dance Picture does not possess of Oraon Tribe. Oraon tribes are not Hindus.They believe one God .They are from the begining the worshiper of Sarna .They believe one God (dharmesh) means Abba. Later they adopted Hinduism and Christianity. They are not Human Sacrificer.I myself belong to Oraon Tribe. Some Correction needed .Insdead of Khalkho you mention Xalxo. Please Coreect the passage and mention the correct information Since this goes to worldwide information.Do give the wrong information. Please do not give wrong information and collection.The information and collection go to worldwide information .Please collect the information from the right person and give information to the world. Dude where the hell are Barla`s?? I dont see u mentioning themin your post, be accurate and also u made a spelling mistake..!! It`s TIRKEY and not tirky..
administrators of this website, please do edit your content or delete the blog. its offensive. this kind of half(miss) informations, are really harmful for us, in the location of oraon(kurukh) the Blogger missed chattisgarh where oraon are facing the displacement problem, and because of the religion, the oraon who accepted the Christianity and Hinduism, are not added as the tribal in census, which cause 0 population had shown in some areas of chattisgarh, directly a open invitation for mining giants to takeover our lands. there are so many sites has very wrong infoormations about oraon tribe. please make good study before posting because somewhere it is affecting our life. We thanks that at least we have not been ignored,as the administrator of this site have published ,related the oraons have contained very less information about us,as well some misinformation have been published in concern with our worship & culture.You are requested to come once in Ranchi in occasion of Karma & Sarhul .You will really find some more & correct information about us.The photo shown in this site is note of us.Our culture,wearings & dance are different.Please reveal our correct tradition & culture. For needful correction you will be appreciated. Thanks for the publication, but the human sacrifice is not acceptable as oraons are mainly dependent on forest of one hand and on other it's said of human sacrifice on sarhul festival, doesn't seem well and must be corrected. well somebody needs to really take interest about the aboriginals of this land that is THE ADIVASIS. the mainstream India still does not have a proper knowledge about us i.e. Oraons, mundas, santhals , etc.... untill and unless our own people do not take interest in themselves nobody is going to have proper knowledge about us. a detailed work is supposed to be done about each tribe by our own scholars, this is because our culture, rituals, beliefs and tradition cannot be understood by others. The right knowedledge about us to others is our own responsibility otherwise anybody and everybody will depict us according to his or her suitabilaty and liking. Hi I was going through there are spelling mistakes of the titles. would request you all to learn kurukh, I know very well Kurukh speaking but not writing. i have many Oraon friends, but none of them could tell me about the ritual sacrifice practices that prevailed long back. A ritual axe-Balua, was used by Oraons and other adjoining tribes. Please if anyone knows about the Balua, please share the views. they still believe in following age old custom of human sacrifice ? dude what? who is this stupid blogger writer ?WE are not cannibals ?? moron !!! I am gonna report this blog for misleading information and this article needs lots of correction . mannered, and hard working, I like to visit the place where the people originate from.